On the Five and Dime Rally I had a big problem with my feet. I'm probably lucky it wasn't more serious. The skin between my toes basically completely peeled away leaving my feet vulnerable to infection. After I got home, what started out as a small problem with athlete's foot quickly spread and was exacerbated by an allergy to the anti-fungal cream. For several weeks after the rally, my feet were in bad shape. During the rally, I was using DryMax socks sold, but not made, by LDComfort. The material of these socks was really good. However, their downfall came that they were normally shaped socks. Wherethe sock material touched my foot, I was fine. However, in between my toes was absolutely destroyed. It made sense when I thought about it. Why did I expect this sock to magically pull moisture away from somewhere it wasn't touching? Full disclosure: the boots I was using were leather and really don't breathe at all. That being said, unless you're going for some really expensive GoreTex boots, its likely that it will be difficult to get a boot that is both breathable and waterproof. Enter Injinji. I found these socks at REI for $10/pair. These socks have individual compartments for each of your toes. Think gloves for your feet. Because of this, they take a little longer than normal socks. You have to put each of your toes into its place individually (or at least, I do). You also have to make sure you are getting the sock on the correct foot, as there is a right and a left. However, the benefits of these socks totally outweigh spending a little extra time putting them on. Since each toe is separated from the others and wrapped in fabric, the socks are able to wick the moisture away from your skin, leaving your toes nice and dry. 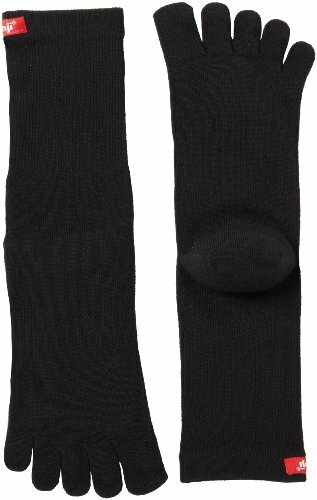 While these socks use CoolMax instead of DryMax, they still do an amazing job of moving moisture away from your skin.